However, there will be no New Year’s resolutions at this time. No January grain bowls. No salads. No fruit and veggie smoothies. No sit-ups. No sirree. This may be Los Angeles, but it’s dreary, rainy (pouring) and cold (more like freezing) outside. I want something hot, substantial and filling, and then I’m curling up in my down comforter in front of the fire. So there. This is where the Green Curry with Chicken & Thai Eggplant comes in. It fulfills the hot, substantial and filling criteria, but the flavors just rock you back on your heels. You take your first spoonful and you say stuff like Oh wow! Oh my god! Mmmm! as you quickly get another spoonful in. Every one of your taste buds is singing with happiness. And there is enough in the pot to have a second bowl. Oh yes. Crappy weather, you are so totally foiled! 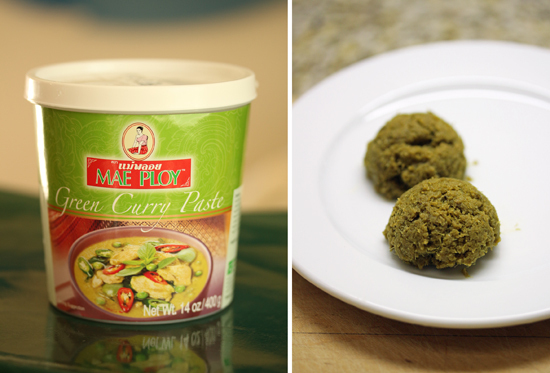 Mae Ploy is my favorite green curry paste. It has a combination of ingredients, each of which is exciting in and of itself, but together offer an explosion of flavors. Green Chili, lemongrass, garlic, salt, galangal, shrimp paste, kaffir lime peel, coriander seed, pepper, cumin and turmeric. I bought mine at the 99 Ranch Market and you can get it on Amazon. Thai eggplants are about 2-inches in diameter. 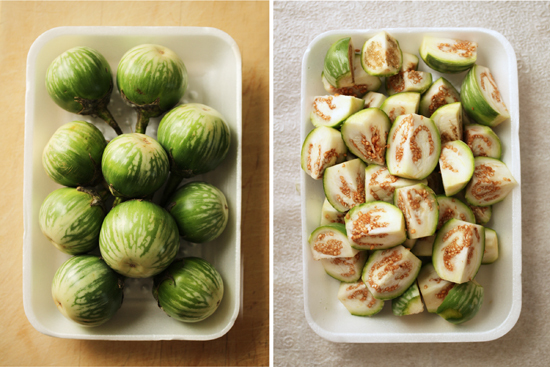 The skin stays sturdy, even when cooked; however, the seeds are soft. If you can’t find Thai eggplant for this recipe, you can substitute other veggies, like zucchini, broccoli, red peppers or green beans. For the chicken, you could also substitute turkey, duck or pork. 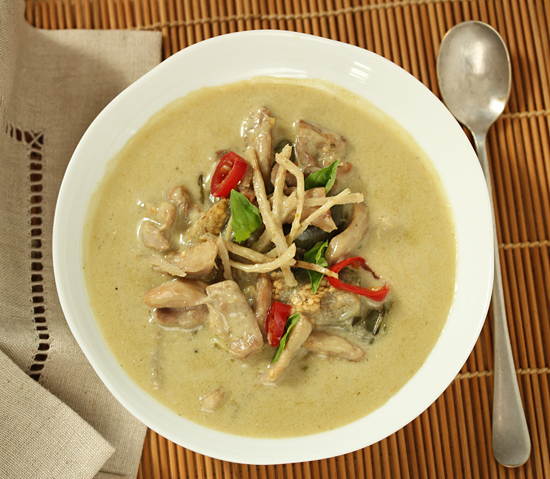 As long as you have the coconut milk and green curry paste, you’re good to go. 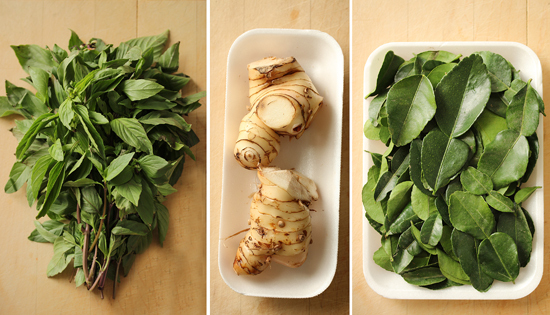 On the left is Thai basil, but if you can’t find it, you can use regular Italian basil. Center is galangal, which is a member of the ginger family. To me it is the defining flavor of Thai food with its floral resin smell. If you can’t find galangal, you could julienne some ginger, but very thin and not too much. Ginger is pretty spicy and hot in large quantities. On the right are kaffir lime leaves, which could be substituted with lime juice. Not quite the same, but similar enough. 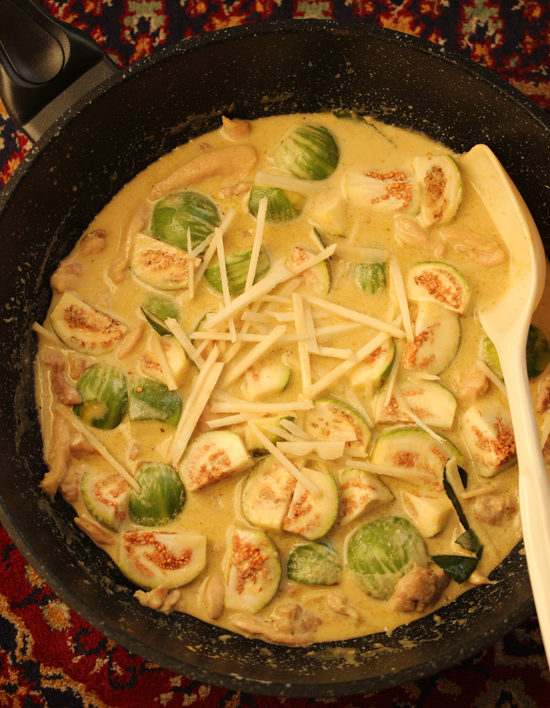 Oh, your Green Curry is going to be so wonderful…. You can substitute other veggies for the Thai eggplant, such as zucchini, broccoli, red peppers or green beans. 1. In a wok or large saucepan, simmer thick coconut cream over medium heat for about 5 minutes, or until cream separates and a layer of oil forms on the surface. Stir cream if it starts to brown around edges. 2. Add curry paste, stir well to combine and cook until fragrant. 3. Add chicken slices and stir until starting to whiten and separate. Add coconut milk, water, fish sauce and palm sugar and simmer over medium heat for another 5 minutes. 4. Add eggplants, stirring occasionally, for about 5 minutes or until cooked, but not mushy. 5. Add galangal and lime leaves. Simmer for about 2 minutes. 6. Spoon into large bowls and sprinkle with basil and chili slices. Serve with white rice if desired. This looks so tantalizing! I often order green curry with eggplant in Thai restaurants and now you’ve demystified it for me. I’ve never used galangal or even seen it in the store. (I saw it listed in some Moroccan food when I was there). And those Thai eggplants are cute little fellers! I am with you on something warm and comforting for the weather we are having. Where did you get the Thai eggplant? They are adorable. I don’t know much about Thai food, but this all sounds wonderful – and something new to learn about in the coming year! I hope 2016 brings you many good things and let’s hear it for good food! This looks so yummy and exotic, beautiful photos as always.